For the fall 2013 dedication of its new synagogue building, Temple Israel Omaha commissioned Omaha Publications to create a commemorative, magazine-style program. I was asked to write four stories for that piece that reflect different dimensions of what that new space means to the leadership and liturgy and how it fits into the emerging Tri-Faith Initiative campus that will eventually find the synagogue joined by a neighborhing Islamic mosque, Episcopal church, and shared interfaith center. My stories follow. Rabbi Aryeh Azriel is known to frankly speak his mind and fearlessly wade into trouble rather than stand silently, idly by. It’s his nature. He and the dynamic clergy team he leads make a good match for the lively reform congregation they serve. Temple Israel’s participation in the Tri-Faith Initiative and decision to build a new synagogue are just the latest expressions of Azriel and his team leading their flock to challenging new opportunities. “There is definitely a spirit in this congregation that allows for those kinds of things to happen. This congregation is extremely courageous,” he says. He feels fortunate havling clergy who enjoy the vital push and pull that characterizes life at Temple Israel. “Aryeh, Josh and Wendy all bring different gifts to Temple. They complement and supplement each other and are very different from each other, but that is one of our congregation’s greatest strengths,” says member Jane Rips. Like their predecessors, Brown and Shermet speak their mind and think outside the box. Azriel wouldn’t have it any other way. “We all challenge each other with no compunction about telling each other we’re wrong,” says Shermet. There are no bruised egos. The clergy team meets Tuesday mornings to plan their week but the trio confab informally most every day. “I can’t tell you how many times during the day we are in each other’s offices because there are things that have to be discussed and some of them are urgent,” says Azriel. The team divides hospital and nursing home visits. They take turns officiating at life cycle events. “The clergy does not isolate itself. The acts of reaching out, teaching others about Judaism, welcoming questions and attending community events are part of their daily to-do lists,” says member Phyllis Glazer. Brown works closely with new education director Debbie Messarano and confers with young families and other congregants without strong connections to clergy. Shermet manages the bamitzvah program and all of the worship music. Azriel ensures the team’s teachings and activities enhance Temple’s mission and vision. The clergy are part of a much larger team. Still, as the father of this congregation for 25 years Azriel has left a huge imprint. Making Reform Judaism relevant to congregants is not an academic question for Temple’s clergy. Much focus is on making holiday observances and life cycle events intrinsic experiences that help members identify with Jewish life and what it means to be a Jew. “It’s on so many levels, definitely on the intellectual level so they know what Reform Judaism stands for,” says Rabbi Aryeh Azriel. ‘It’s also important to recognize that Reform Judaism of 50 years ago is not the same Reform Judaism of today. Infusing new life into old rituals is one way of keeping things fresh. Azriel says, “Many times we work on traditional vessels that maybe go back to antiquity and try to fill those old vessels with new meaning. That’s the reform tradition. So there is a tradition of immersion in the mikvah but we took this old vessel and brought a new meaning to people battling cancer and addiction and all those things. 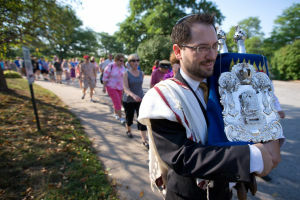 Rabbi Josh Brown says the more members connect their lives to Temple the more opportunities they have to connect with their Jewishness. He says whenever members choose to participate in a celebration or ritual, it’s an opportunity to grow in their Jewish heritage and faith and to be part of a continuum. One of those traditions, Shabbat, the Jewish day of rest, encourages believers to look inward in order to grow in faith. Azriel says living out Judasim must be a daily thing. The building will fill with memories, emotions and stories with each ritual and celebration held there. On Sept. 28 Stacie Spies-Matz and Jay Matz have the honor and privilege of their daughter Samantha Matz being the first Bat Mitzvah in the new Temple. To enhance worship in the sacred spaces of its new synagogue, Temple charged five artists with creating symbolically-rich ritual objects embedded in Jewish faith and practice. Each artist met extensively with Temple clergy to discuss the religious significance of the ritual object they were commissioned to make. An exhaustive process determined where art would be located and what it would convey before a jury identified and commissioned the appropriate artists to create the pieces. The Bemis Center for Contemporary Arts facilitated the process. The idea was to make art integral to spaces, not mere adornments. The central ritual object on the bimah (the altar or sanctuary) is the Ark (Aron Hakodesh), which is the repository of the Torah scrolls. Many synagogue arks are dramatic works of art or craftsmanship in wood or metal, filled with symbolic elements representing parts of the Jewish tradition. Olson says the soft flow of Avadenka’s hand-drawn work offers a pleasing contrast to the clean, sharp lines of the space’s other designs. “The commission for the Temple comes with a sense of responsibility to make sure what I am doing is satisfying the members of the Temple and their sense of what their sanctuary should be, along with the aesthetic sensibility of the architect,” says Avadenka. Nashville, Tenn.-based artist Mel Ziegler is preparing an outdoor sculptural piece for the entrance that will invite members and visitors to interact with the work and perhaps add onto it. He’s responding to a Hebrew passage viewable above the entrance that reads, “Guard our going and coming, to life and to peace, evermore.” Ziegler envisions his work integrated into new traditions at Temple and reflecting the congregation moving forward and embarking on a new path. In one way or another the work of Ziegler and his fellow artists all express the vital, searching, engaging nature of Temple’s people. On Simon’s recommendation the synagogue hired the Bemis Center to manage the process that selected and supported the artists. Between 80 and 100 congregants attended a 2011 workshop. “We asked the congregation to bring to life in words and stories the past present and future of Temple Israel. What it meant to them on a very personal level,” says Simon. “We noticed certain themes and ideas emerged. We knew where we wanted art to potentially touch the building.” The Bemis then assembled a jury of curators and experts who came up with the artists invited to submit an RFQ (Request for Qualifications). From dozens of submissions five were selected. In addition to the art pieces Temple commissioned original music for the dedication by three composers. Jonathan Comisar, music director at Congregation Kol Ami in White Plains, NY and on the faculty of his alma mater, Hebrew Union College School of Sacred Music, writes Jewish music for synagogues and other organizations all over the nation. Comisar was asked by Temple Israel Cantor Wendy Shermet to compose a piece of art music that draws on the Hashkiveinu prayer. His piece, “Hashkiveinu: A Shelter of Peace,” is scored for cantor and choir as well as for violin, cello, clarinet and flute. “It was a wonderful, challenging task,” says Comisar. Guest artists for the performance will feature Comisar at piano and select Omaha Symphony members. The other original musical works for the dedication are by organist-composer Kurt Knecht from Lincoln, Neb. and songwriter-playwright Karen Sokolof Javitch from Omaha. He is music director at St. Mark’s on the University of Nebraska-Lincoln campus and artistic director and conductor of the Lincoln Lutheran Choir. She is a member of Temple Israel. Knecht’s piece, “Shalom Aleichem,” is for girls and women. Javitch’s piece, “Noah,” is for children. Temple Israel and the Tri-Faith Initiative grounds comprise a lovely but small corner of the 153-acre mixed-use Sterling Ridge development that’s 10 to 12 years from full build-out. Temple and its interfaith partners bring deep currents of history, memory and spirituality that stand apart from the development’s retail and business tenants. Temple alone carries 142 years of traditions. Congregants will soon be neighbors with members of a mosque and a church and their own long faith traditions as well as with residents of an assisted living-memory care facility and with employees and customers of various commercial enterprises. All of it affords opportunities to put faith in action. There wouldn’t be a new Temple in the Tri-Faith venture without the building project leadership team. 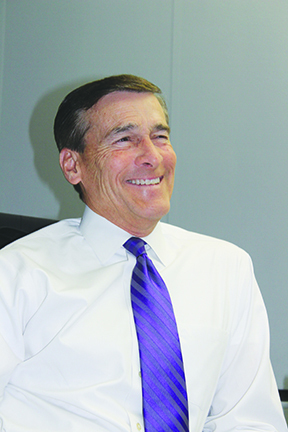 Temple member Ted Zetzman is a builder by trade. He and John Waldbaum worked closely with Finegold Alexander Associates, Charles Vrana and Son Construction Company and Lockwood Development’s Chip James on delivery of the new synagogue. “What made it have special meaning is that Temple came to me and said we need your help with this and it was something I really knew how to do and could help with,” says Zetzman. He credits principal architect Maurice Finegold with conceiving the new Temple as a translucent lantern on the prairie. Project Advocates helped find the glass to realize that vision, along with the exterior Jerusalem stone and other materials. Bound up in coming to the new building is honoring the old building’s rich past. Temple long deliberated whether to move and once the decision was made it next had to decide where to relocate. Zetzman says the Temple project and Tri-Faith presence make a great fit for Sterling Ridge by giving it the high profile civic use it needed. Azriel sees as providential and ironic Temple and Tri-Faith finding the spot of a former Jewish country club that formed in response to Jews being excluded elsewhere. Brown imagines Temple serving a similar function Highland Country Club served. “Jews wanted a place where they could sit down and be with the people they cared about and related to best and I think a lot of the design of our new building is to that same purpose. We want people to feel the synagogue is an extension of their home. We want to be a place where people will feel they’ll run into people they know. Azriel says the new site is the best opportunity to ensure the growth of Reform Judaism in Omaha with the building’s many sacred spaces and expanded social, educational and administrative facilities. The majority of members reside nearby, too. Then there’s the interfaith engagement. Azriel says, “The dream is to discover the image of God in all of us and to see how that image is actually the same. It’s not about symbols, it’s about being neighbors. We’re going to hopefully understand what is the meaning of walking into each other’s homes. The way Azriel sees it Temple’s participation in the Tri-Faith is “an outcome” of its longstanding inclusivity.